One of my favorite scents in the whole wide world? Roses. So it only stands to reason that the Jo Malone Red Roses Home Candle has made its way into my life. Seven types of roses weave together to make up the intricate aroma that wafts out of the jar when this candle is lit. Yes, seven! They're taken from around the world and mixed with notes of crushed violet leaves, lemon and spearmint to create a scent that's rich, complex and completely delightful. There's just something so beautiful about every Jo Malone candle. Maybe it's the simple glass jar with the black-lettered white label. Maybe it's the fact that when I light one, I feel elegant and refined. Or maybe it's simply because each and every candle smells absolutely amazing. In any case, Red Roses is most definitely my favorite. 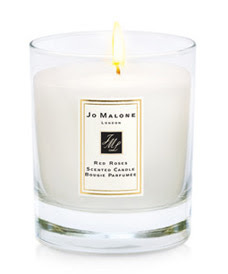 The Jo Malone Red Roses Home Candle retails for $65 at jomalone.com.